Summary: After some wannabe-artistic shots of people on the track team at West Beverly, Brandon chats with the coach, Chapman, for a newspaper article. Steve is paranoid that Chapman said something to Brandon about him. He’s worried he’ll be cut from the team. Kelly and Donna talk to Kyle, who Donna is surprised isn’t dating Kelly. (He’s possibly gay, remember.) Steve’s all jealous. Elsewhere, Brenda asks Cindy to tell Brandon to stop teasing her about her driving. The guys on the track team want to give Brandon a wedgie, since he wrote some not-so-nice things about him for the paper. Steve tries to get in on the act. Brandon says he can probably outperform Steve at other sports. Later, Brandon tells Andrea that Chapman’s putting him on the track team, and she notes that he can now write about sports from the inside. He thinks it’s unethical. Actually, he wants an excuse to quit sports reporting. Andrea considers taking over the beat for him. Brenda asks to be allowed to drive Brandon’s car whenever he’s not using it. Jim thinks that’s reasonable, but Cindy says that’s just because he’s never driven with her. Jim wants them to give her confidence. When Brandon comes home, Brenda gives him the news that he’s now sharing his car with her. He’s surprisingly okay with it. Steve, on the other hand, is ticked because Brandon is now running in his place on the team. Dylan tells Brandon he shouldn’t have agreed to let Brenda drive his car since now she’ll want to drive his. Brandon says she’s not actually that bad a driver. Brenda drives around with Donna and David, rear-ending a woman at a light. There’s very little damage, so the other woman says she’ll just let it go, though they exchange phone numbers just in case. Brandon works out with the rest of the track team, making a joke about steroids to a guy named Burke. It makes everyone freeze. Brenda freaks out about Brandon’s reaction to her fender-bender and the dent it left in the front bumper. Donna tells her to keep quiet and play dumb. Brenda claims she’s a horrible liar, especially when it comes to her brother. When Brandon gets home, he doesn’t notice that anything’s wrong, so she decides to take Donna’s advice and not say anything. Steve runs into Kelly at the Peach Pit and flirts with her, but she’s planning an early-morning run with Kyle. Steve thinks they’re sleeping together. He talks to Brandon about the track team, which Brandon doesn’t think is that talented. Steve thinks he’ll be more comfortable with the team soon, then tells him that joking about steroids is a bad idea. They fight about doping and Steve gets mad that Brandon always has an answer to everything. Andrea comes by after hours so Brandon can talk to her about a possible article about steroid use at West Beverly. Andrea asks if that means he’s back on the paper; he says he never left. She knows how he feels about going undercover since she did when she wrote a story about the cafeteria. She also knows how it feels to be in a battle opposite a friend. The next morning, Kelly and Kyle go for their morning run and he tells her he likes getting to be himself around her. Steve tells Burke that he talked to Brandon about the “program,” and though he’s not on board, they can trust him. During their next workout, Brandon asks Burke for something to help him get stronger. Burke doesn’t take the bait. At home, Jim gets a call from the woman in the fender-bender, and Brenda has to come clean about the accident. Jim is reasonably angry with her for not mentioning it since she’s on his insurance. The woman is now complaining of whiplash and blaming Brenda. Brandon meets up with Kyle, who’s figured out that Brandon’s doing an article on steroids for the paper. He admits that a lot of guys are doping and it needs to stop before someone gets hurt. In exchange for anonymity, Kyle agrees to answer Brandon’s questions. At school, Brenda gives exposition letting us know that she’s not in trouble for the fender-bender. Brandon makes up with Steve before telling Andrea he’s having second thoughts about publishing his article since it could hurt a friend of his. She offers to take over as point person. Brandon tells Steve that the paper is about to publish an article about steroids, so if he has any in his locker, he should get rid of them ASAP. Not long after, Chapman confronts the team, telling them that practices are canceled until the users come forward. Tony thinks Steve is the source. Burke tells them to keep cool because Chapman won’t cancel the whole season. Tony warns Steve to tell Brandon to watch his back. Brenda and Dylan take flowers to the woman from the accident (Rosemary), but she tells them she can’t talk to them because there’s a lawsuit coming. She notes that Brenda’s driving record could be affected. Rosemary wanted a settlement for her pain, suffering, and physical therapy, but Jim wants to go through the insurance company. She totally doesn’t want Brenda to get in trouble or anything, but could she talk to her father? This leads to a fight between Jim and Brenda about compassion and taking responsibility vs. being snowed by a con woman. 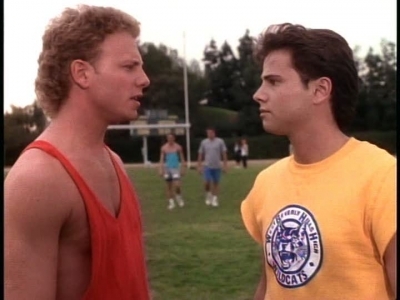 Steve goes to the Peach Pit to confront Brandon about not actually quitting the Blaze. Brandon admits that he asked some questions and uncovered some things. Steve tells him he just started taking steroids, but he quickly decided it’s not worth it. Now he needs to prove to the other guys that he wasn’t the source. He wants Andrea to write something defending him, thinking Brandon can get her to do it. Brandon won’t do it since he needs to protect his source. Steve shows some lame roid rage and gives him a lamer warning, which Kelly sees and hears. The next day, Kelly asks Kyle to tell her the real story about what’s going on with the team. She presses him to help clear Steve’s name. Later, Kyle spots Steve and Andrea talking about the article he wants her to write. Brenda argues with Dylan about how Jim told her she can’t have any more contact with Rosemary. Steve gets angry over Andrea’s refusal to print his statement, telling Dylan that his so-called friends are more interested in putting out the paper than defending him. He accuses them of organizing a witch hunt. Dylan reminds him that Brandon is super-loyal and awesome. Brandon, Steve, and Kelly recap the situation at the Peach Pit, where they’re joined by Brenda and Dylan, the latter of whom just let the former drive his car. After Brenda leaves with Brandon’s car, everyone hears a crash and runs outside. It’s just a garbage truck. Ha…ha? Thoughts: Tony is played by Michael Cudlitz, who’s been in pretty much everything, most recently Southland. I’m pretty sure Brandon says “sho ’nuff.” Brandon, don’t make me hurt you. The guys on the track team wear some pretty awesome ’90s workout clothes, including a shirt that shows Burke’s belly button. Why does Brenda keep driving David and Donna places? Why don’t she and Dylan just double-date with them? Or tell them to take a bus? Love it! I’ve only just found your blog so you may have already covered this, but how annoying was it when Brandon would say things like “seldom right and wrong again”? Answer: very.